Date written: Between 612 and 589 B.C. Setting: Babylon was becoming the dominant world power and Judah would soon feel Babylon's destructive force. Judah taken captive to Babylon by Nebuchadnezzar in 586 B.C. Occupation: Prophet of the Lord, and possibly also a temple musician or singer (Hab. 3:19). Best known today as: The prophet whose “burden” is given in the book of Habakkuk, possibly written at about the same time as the battle of Carchemish (c. 605 a.d.; see Jer. 46:2). Word in life study Bible . 1997, c1996 (electronic ed.) (Hab 1.2). Nashville: Thomas Nelson. Served as a prophet to Judah from 612-589 B.C. Judah's last four kings were wicked men who rejected God and oppressed their own people. Babylon invaded Judah twice before finally destroying in 586 B.C. It was a time of fear, oppression, persecution, lawlessness, and immorality. Habakkuk couldn't understand why God seemed to do nothing about the wickedness in society. Then he realized that faith in God alone would supply the answers to his questions. Instead of questioning the ways of God, we should realize that he is totally just and we should have faith that he is in control and that one dasy evil will be utterly destroyed. Jeremiah (627-586 B.C. ), Daniel (605-536 B.C. ), Ezekiel (593-571 B.C.). When Habakkuk was troubled, he brought his concerns directly to Go. After receiving God's answer, he responded with a prayer of faith. 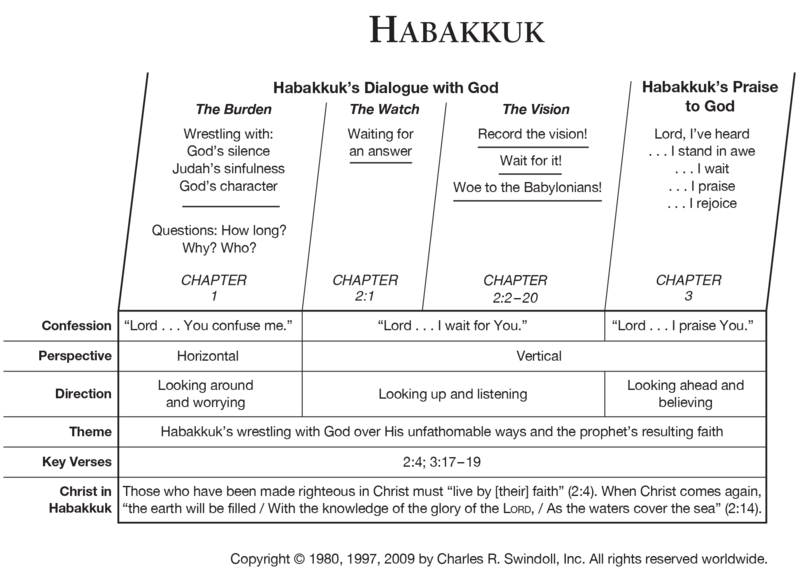 Habakkuk's example is one that should encourage us as we struggle to move from doubt to faith. We don't have to be afraid to ask questions of God. The problem is not with God and his ways but with our limited understanding of him.